Video games long ago freed RPGs from the confines of the kitchen table, but some would argue something vital was lost along the way. The intimacy, unpredictability, and the friendly antagonism between Player and Dungeon Master. There’s a reason people still break out the graph paper and 20-sided dice even when there are much more technologically-advanced roleplaying options available. 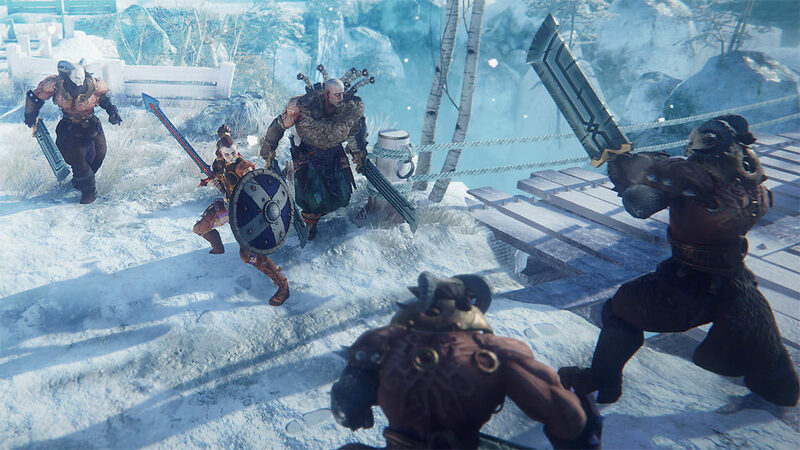 The Hand of Fate games attempt to combine that classic RPG appeal with more modern elements. Your adventures are literally laid out on a table by a shadowy card-dealing DM, but you also engage in real-time hack ‘n’ slash combat and other distinctly video-gamey things. Is Hand of Fate 2 a successful melding of old and new? Or should the game be thrown on the discard pile? As mentioned, Hand of Fate 2 pits you against the Dealer, who builds mildly-randomized quests, called “challenges,” using cards. They’re arranged on the table in different configurations and each turn you move one space, flip the card you landed on, and deal with whatever it throws at you. You may have to engage in a little “Choose Your Own Adventure” decision making, take part in a game of chance, or clash with a pack of baddies. As you make your way through the cards, you’ll also need to keep a close eye on your health, money, food cache, and level of fame. Each challenge is partly made up of its own unique cards, but before embarking you also choose your battle companion and a selection of encounter and equipment cards from your own deck. In theory, this gives you some control over how challenges play out, but, particularly at first, the effect is rather limited. The cards exclusive to each challenge are always the most important, and your deck simply isn’t varied enough alter things in an interesting way. Typically, I’d just choose the most obviously beneficial/powerful cards repeatedly. Why include, say, the Raiders Ambush card that may help or harm me, when I could just stick with the Arm Wrestling card that’s easy to win at and pays a ton of gold every time? It just didn’t feel like there was a lot of strategy to card selection. At least, not at first. Every time you complete a challenge, you’re awarded new cards and eventually your deck swells to the size where choosing cards becomes a bit more interesting. Even then, there still a lot of powerful, purely-beneficial cards you’d be a fool to leave out. Challenges are initially fairly straightforward but quickly become more creative. 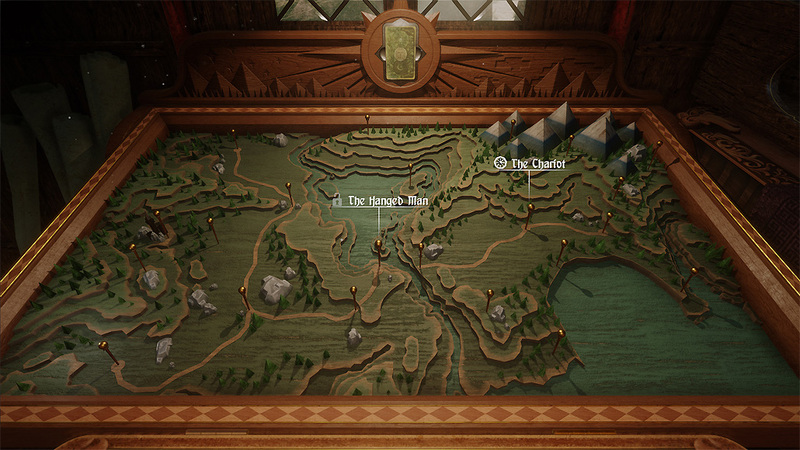 You may have to search for relics in a vast wilderness, deduce the identity of a would-be assassin, or gather resources to defend a fort from a barbarian horde. Some challenges aren’t so much creative, as they are sadistic – the less said about the one that starts you off with only 10 health points, the better. 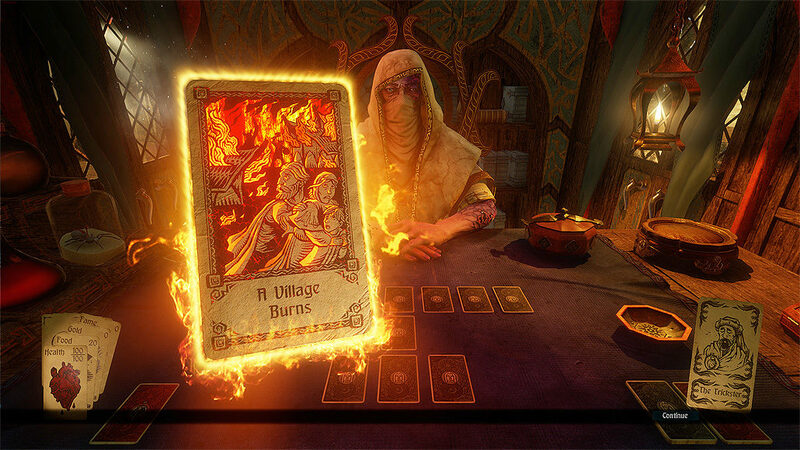 Hand of Fate 2 manages to convey an impressive array of different narratives with just a few cards strewn across a virtual table. While I admired the ingenuity of Hand of Fate 2’s diverse challenges, I didn’t always enjoy playing through them that much. Most the game’s events include an element of chance — a random card selection, roll of the dice, or blind decision. The consequences for failure are often nasty. Sometimes there’s no way to avoid punishment. Don’t like that your dumbass character just ate poison berries and permanently lost 25 percent of his health? Too bad! Once you learn the correct choices and strategy for each encounter you’ll be able to squeak by, but it may take a while to get there. 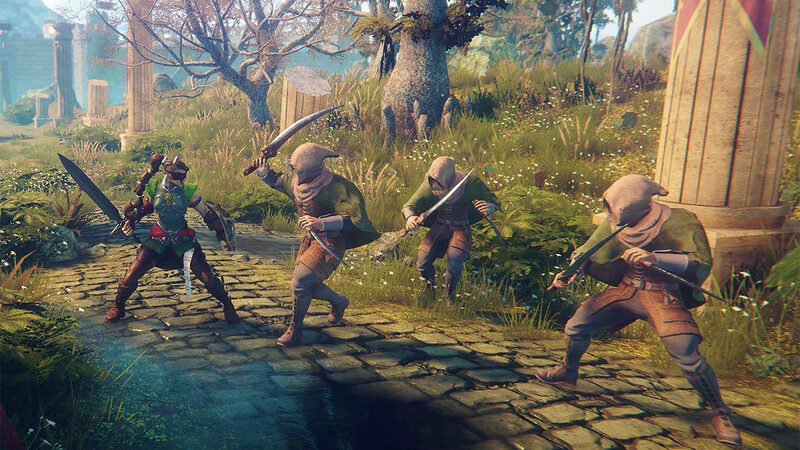 Hand of Fate 2’s frustration factor is only compounded by its combat. Several times per challenge you’ll be whisked away to various 3D arenas, where you’ll test your mettle against packs of enemies. The battle system is simple enough – you can attack, dodge, block, counterattack, shield bash, activate you or your companion’s special move, and take out stunned enemies with a gory finisher. Imagine if Batman: Arkham Asylum looked kind of janky and didn’t handle particularly well, and you’ll have a good sense of what you’re in for. Arkham-style combat requires split-second timing, and Hand of Fate 2’s laggy, unresponsive controls aren’t up to the task. Whether or not your block or counterattack registers is pretty much a crap shoot, and enemies love to swarm you and attack from behind. The combination of randomness and uninspired combat means you’ll be dying a lot in Hand of Fate 2, and when you do, you’ll have to restart your current challenge from scratch. Played almost all the way through and died fighting the boss? Sorry, that’s 40 minutes of your life wasted. Worse, with the occasional exception, most cards are only gained by fully finishing a challenge. There aren’t a lot of options for grinding or improving through defeat. You can try to take on a different challenge, but if all the available options are just as difficult (as they often are), you may find yourself banging your head against the wall, hoping for a lucky run so you can finally expand your deck. The feeling of growth you get from a good RPG is lacking – as I built my deck I didn’t necessarily feel any more powerful. Hand of Fate 2 delivers around a couple dozen challenges, which took me about 20 hours to play through. Unfortunately, the game started to feel like a slog well before I reached the end. The game’s uninspired story didn’t help matters. Some individual character moments or bits of saucy dialogue are enjoyable, but the overall plot, focused on a loosely-sketched conflict between a powerful Empire, northern raiders, and dark magic wielders, is by-the-book fantasy stuff. The meta-story isn’t any more compelling – the game is rather vague about why you’re participating in the Dealer’s twisted game until near the end. It’s difficult to care about a game if you don’t know what you stand to win. This review was based on a PC copy of Hand of Fate 2 provided by publisher Defiant Development. Hand of Fate 2 captures some old-school RPG charm, but deals a few too many bad cards in the process. The game’s appealing premise is marred by unsatisfying progression, punishing randomness, and clunky combat. Nostalgic RPG fans will find things to appreciate here, but given the popularity and diversity of actual tabletop gaming these days, it’s hard to fully recommend the half-stacked Hand of Fate 2.